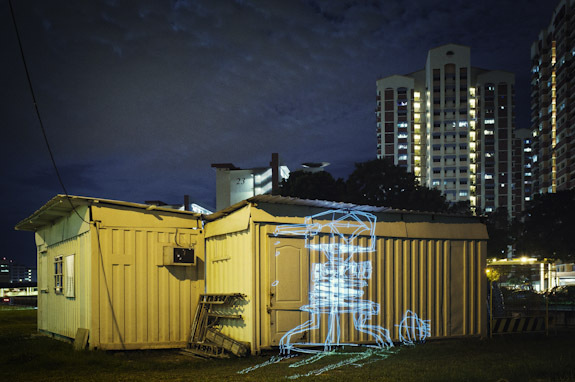 Project Guerrilla Graffiti is a collaborative effort between artist and designer Lun Cheak and photographer Szeling, capturing artwork projected onto public spaces in Singapore. It’s an endeavor to explore what art would look like in graffiti-scarce Singapore, and considers what if Singapore were more liberal with graffiti art. It is also an exploration of graffiti through a different medium, one that is not illegal. The artwork is created by Lun Cheak on his iPad, then connected directly to a projector. The duo scout for interesting locations around Singapore where space and art fits. Upon documenting the projected landscape, Szeling went further with the crafting of the images, injecting a vivid mood to these images that blends the artwork and the environment together, complementing each other as a visual art piece itself.